Ackermann’s Repository of Arts, April 1810. 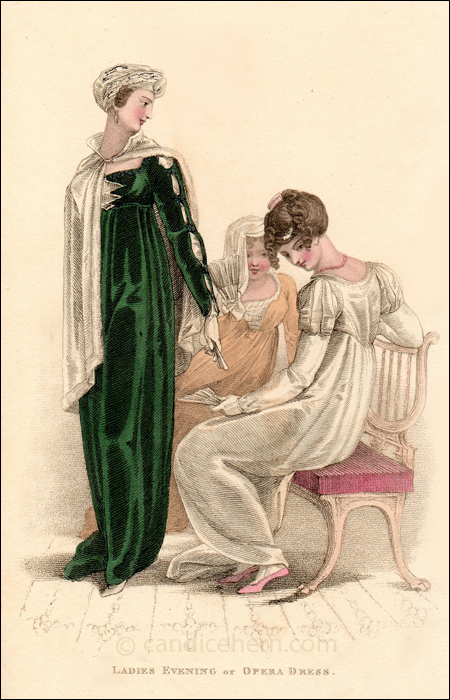 This print is particularly striking for its lively arrangement of the three figures, ladies who look to be commiserating together or gossiping, or perhaps reassuring the seated lady in front that the gentleman she admires will indeed ask her to dance. Shoes are seldom given much attention in the design of fashion prints, but here one wishes the artist had been more specific, as the descriptions of the slippers sound gorgeous. “A Group of Female Figures in Evening or Opera Dresses. “The erect figure represents a female in a robe à la Russe, of spring green velvet, with appliquéd stomacher and slashed long sleeves of white satin, ornamented with pearl. A Mizra turban of frosted satin, with large pearl crescent in front. White satin mantle, trimmed with gossamer down, and confined in front of the throat with a diamond broach. Diamond necklace and ear-rings. White satin slippers, laced and bound with silver. White kid gloves, and a fan of carved ivory. 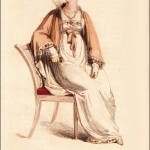 “Sitting Figure: A white satin slip à l’antique, trimmed with gothic lace; long sleeve, full at the top, with cuffs to correspond with the style of the dress. Laced stomacher front, peaked both behind and before at the bottom of the waist. Hair in the eastern style, confined with a comb ornamented with pink topaz, and flowing in loose irregular curls over the bands in front. Era-rings and necklace of pink topaz. Pink satin slippers, with silver gothic clasps. 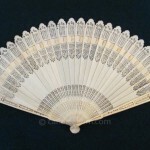 White crape fan, wrought in silver jessamine.